Great News from Healthcare Real Estate Insights™! 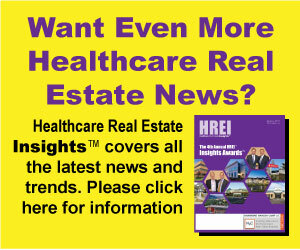 Healthcare Real Estate Insights™ and HREI Executive Briefing™ have now been combined into a single upgraded, redesigned, full-color, glossy publication reaching BOTH hospital, health system and medical practice group executives AND healthcare real estate professionals — more than 2,500 every month! If you advertised in HREI Executive Briefing™ in the past, you can now advertise in the “new and improved” Healthcare Real Estate Insights™ and reach the same provider audience PLUS the entire HREI™ subscriber list for about the same rate you previously paid for only HREI Executive Briefing™ making the “new” HREI™ an even better advertising value than ever. And if you haven’t advertised with us in the past, there has never been a better time to start. ■ Industry Pulse Blog. The editors of HREI™ will be blogging regularly, providing up-to-date news and commentary on key events in healthcare real estate, such as commentary on the latest news and remote coverage from industry conferences. ■ Breaking News. We will post every relevant healthcare real estate news release we receive. ■ Thought Leaders. We will post approved, reader-submitted contributed articles, white papers and other content from industry leaders. ■ Healthcare Real Estate for Sale or Lease. We will post approved, reader-submitted listings of medical office buildings (MOBs) and other healthcare real estate for sale or lease as a service to our readers and at no cost to the paerties involved.